Brilliant jumping spider (Phidippus clarus) occurs across North America from coast to coast. It is very common in Minnesota. A study in 1997 surveyed jumping spiders in 30 locations around Minnesota. The author collected 572 jumping spiders representing 15 species. Brilliant jumping spider was by far the most common, with 299 specimens (52%) collected. Brilliant jumping spider is found from July to September in moderately moist fields on grasses and perennial plants. It is a small to medium-sized spider (order Araneae) but a relatively large jumping spider (family Salticidae). Adults are mostly black with four pairs of white spots and two red stripes on the abdomen. The female is a paragon of parental perseverance. In the fall she creates a large white egg sac at the top of a tall grass or herbaceous plant and drops eggs into the sac. She prevents the eggs from drying out by repeatedly adding silk to cover the egg mass. She stays with the egg sac until the young disperse in about a month. During this time she does not feed and usually dies from starvation a few days later. This entry was posted in Arachnids and tagged brilliant jumping spider, Phidippus clarus on November 21, 2018 by John Valo. At only one tenth the width of a human hair in length, a crimson erineum mite (Aceria elongatus) is barely visible to the human eye unaided by magnification. Its claws, dorsal shield markings, and other identifying body features are not. Identification in the field is possible only by noting the properties of the abnormal growths (galls) it produces on its host. Crimson erineum mite is a plant parasite infecting only sugar maple and possibly black maple. It is common in eastern United States and Canada. When injured by a mite, a leaf cell produces a small projection filled with colored fluid on the upper surface. Small patches of these are usually scattered over the leaf surface. They are greenish-white at first, soon becoming crimson or purplish. They reach their maximum extent, and are most noticeable, in summer. The infestation is sometimes abundant and can cause leaf distortion and premature leaf drop. This entry was posted in Arachnids and tagged Aceria elongatus, crimson erineum mite on March 30, 2018 by John Valo. 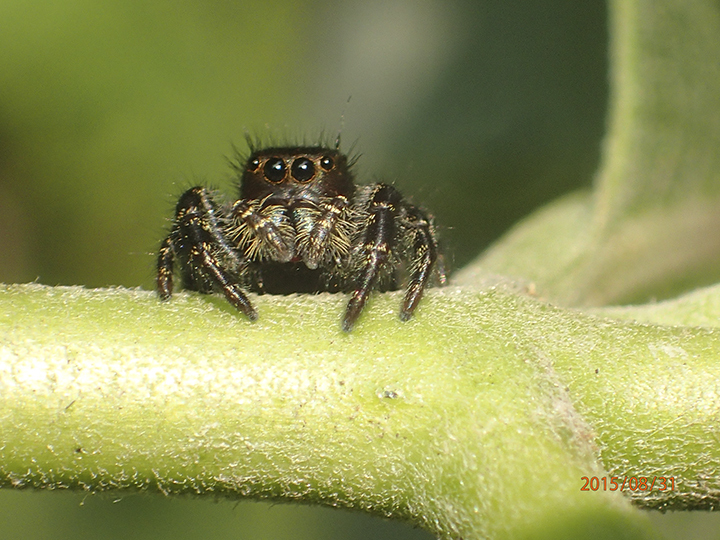 Bold jumper (Phidippus audax) is an extremely common jumping spider in eastern United States. It is a medium-sized spider but a very large jumping spider. It can be found from spring to fall in old fields, prairies, open woodlands, backyards, gardens, and human houses. The most distinctive feature of this spider is the iridescent green or blue mouthparts. Both sexes share this feature, but when courting, the male will wave its forelegs and sense organs (palps), showing off his colorful parts. Bold jumpers hunt during the day, not at night. They sneak up on their prey and pounce, releasing silk while jumping as a drag line to prevent falling. They will bite if molested but are usually too quick and wary to be caught. They can jump 10 to 50 times their body length. There are about 5,000 species of jumping spiders. Bold jumper is distinguished by its large size; conspicuous, iridescent green or blue mouthparts; massive, high, front body segment with rounded sides; four pairs of matte black spots on the abdomen; the arrangement of usually four pairs of white spots on the abdomen; and its occurrence in the northern United States. This entry was posted in Arachnids and tagged Bold jumper, Phidippus audax on November 11, 2015 by John Valo. 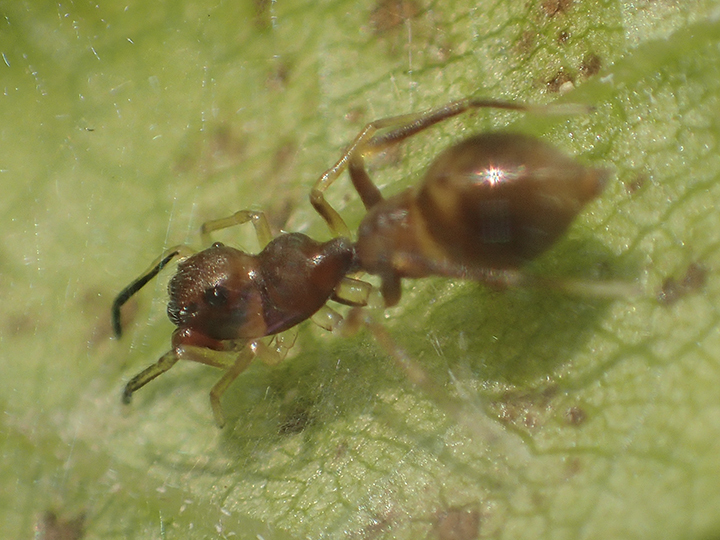 Ant-mimicking jumping spider (Synemosyna formica) is often overlooked and mistaken for an ant. It is found in bushes and tall grass from Vermont to Georgia west to Minnesota and Texas. Most jumping spiders have furry round bodies. Ant-mimicking jumping spider is a Batesian mimic, evolved to imitate the appearance of ants which are avoided by ants, mantises, and larger jumping spiders. The ant-like modifications include a constricted abdomen and front legs that are curved, mimicking ant antennae. There are more than 300 species of spiders that are ant mimics. Ant-mimicking jumping spider is distinguished by a sharp downward slope between the head portion and the thorax portion of the cephalothorax; narrow, parallel-sided rear portion of the cephalothorax; white or pale marks at the abdominal constriction; and in the palpal bulbs of the male the embolus is fixed to the tegulum. This entry was posted in Arachnids and tagged Ant-mimicking jumping spider, Synemosyna formica on October 23, 2015 by John Valo. 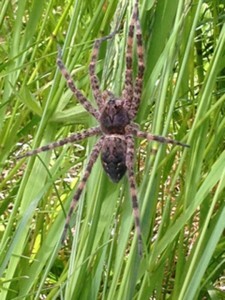 Dark fishing spider (Dolomedes tenebrosus) is a large, robust, nursery web spider (family Pisauridae). 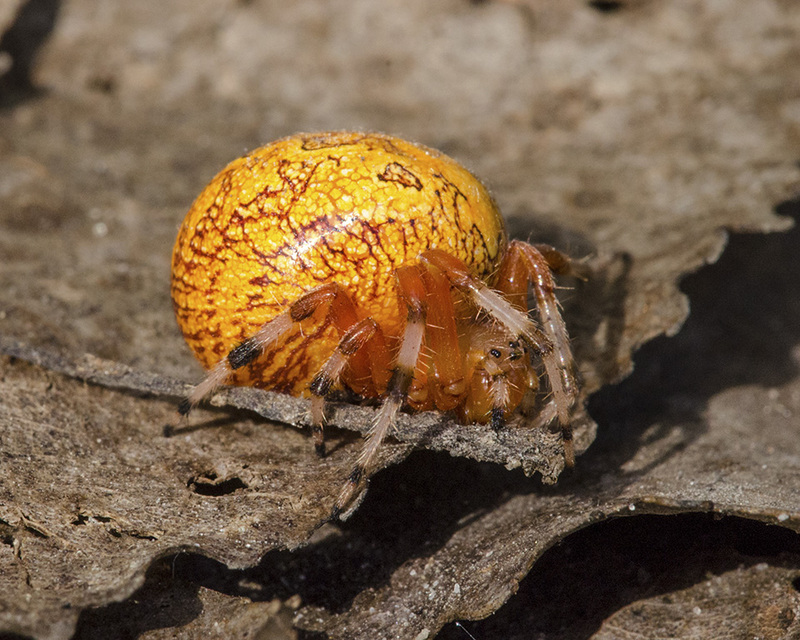 The common name is misleading, as this spider is most often found in deciduous forests, often far from water. This is the largest fishing spider (genus Dolomedes). The adult female body can be up to 1″ long with a legspan of over 3″. The male is about half that size and one-fourteenth the weight. The body is light brown with dark markings and the legs have alternating light and dark bands. The male never survives the mating process. This is not because it is killed by the female, as with black widow spiders. The male has evolved to die spontaneously after mating, providing the female with a meal to nourish her eggs. Fishing spiders are similar to, and often mistaken for, wolf spiders. They are distinguished by the arrangement of their eyes and the mode of perching. Dark fishing spider is similar in appearance to striped fishing spider (Dolomedes scriptus) but is larger and has less white marking on the abdomen. 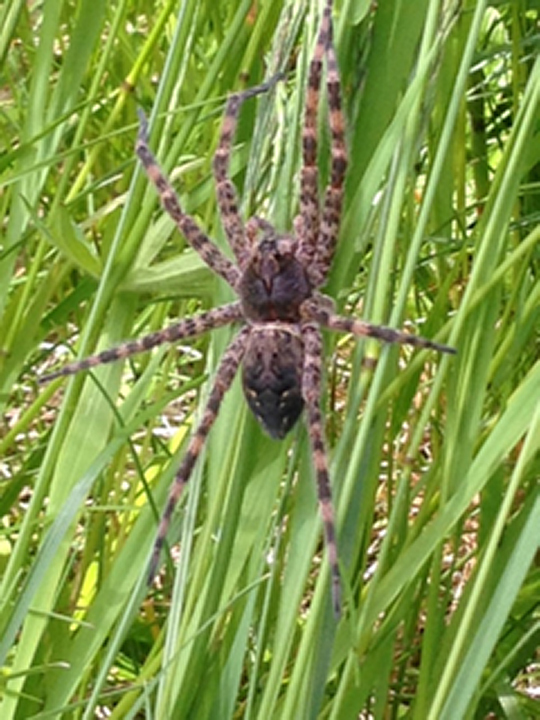 This entry was posted in Arachnids and tagged Dark fishing spider, Dolomedes tenebrosus on June 20, 2015 by John Valo. 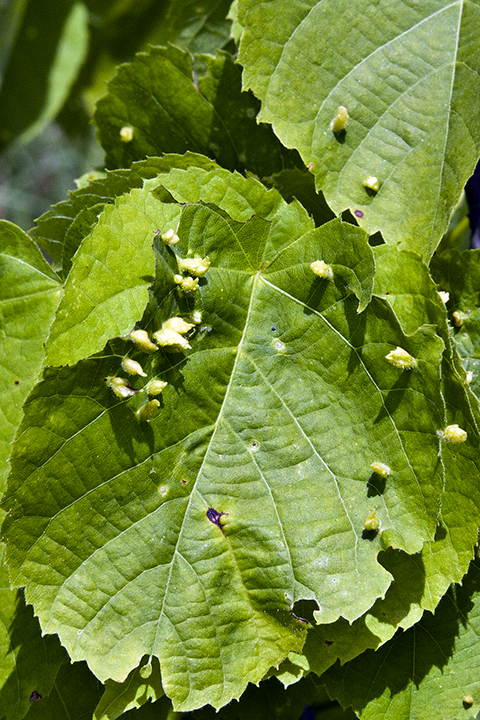 In Minnesota, linden leaf gall mite (Eriophyes tiliae), a specialized plant feeder is found only on American basswood and littleleaf linden, usually the lower leaves. In other parts of the country it is also found on lime trees. 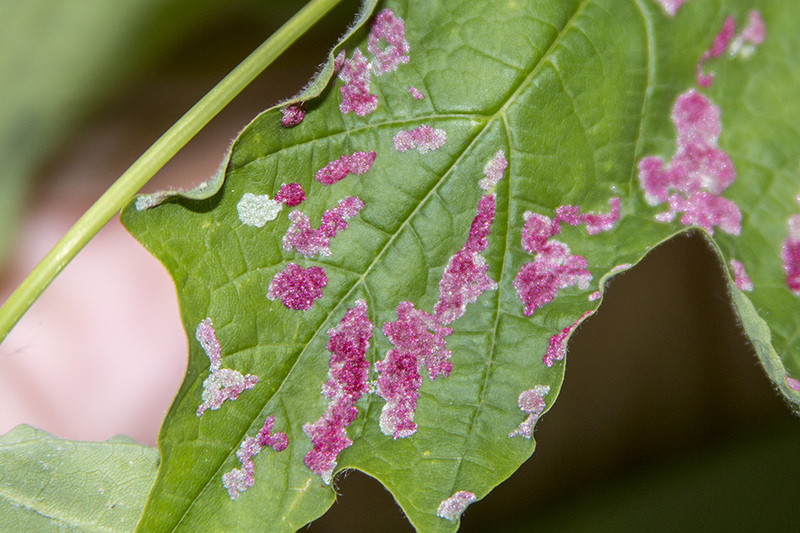 As it feeds on the leaf it causes the host plant to create finger-like galls on the upper leaf surface. The galls are unsightly but the infestation causes no harm to the host tree. This is a common species yet little is known of its life cycle. The adult spends the winter in a crevice in the bark or near a bud. The first galls appear in June. This entry was posted in Arachnids on February 10, 2014 by John Valo.